In my weekly book wrap-up, I share with you the new books that have arrived at my place. No matter if I won a giveaway or got approved for a reviewer´s copy, got an ARC or just bought a new one. And I will tell you a bit about the how and why I added them to my shelves and why I wanted them in the first place. 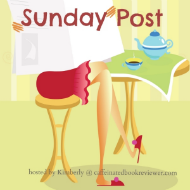 Weekly Book Wrap-Up is a combination where I link up with Tynga and Kimberly and their blogs. The rest will stay the same, don´t worry. I´ll keep you posted on what is going on with my bookshelves and the little stories about them. Stacking The Shelves #45 is hosted by Tynga´s Reviews. A meme that is all about sharing the books you are adding to your shelves, may it be physical or virtual. This means you can include books you buy in physical store or online, books you borrow from friends or the library, review books, gifts and of course ebooks! Well, the past week was one where I had to proof to myself that I am a patient person. The plumber who was hired by my landlord to fix the broken faucet came and took a look at the problem. One look and I got told that I needed everything new and he would call as soon as he would have all the stuff needed and come again to repair my pipes. When I asked for a timeframe he said: “tomorrow between 8 am and 5 pm if a new faucet is in storage”. Apparently, they had none because the next day nothing happened. No plumber in sight. I was about to go out of the house to get at least some grocery shopping done when the phone rang and I got told that they now had it and the next day someone would come to repair it. The timeframe got a bit tighter foretold but I still had another day with waiting and where I didn´t achieve much more. My head was obviously confused about the “Don´t touch the faucet!” thing. The fun part of all this: the plumber needed my help! Can you imagine? I actually was allowed to help him fix my kitchen sink *YAY* I´ve never done that before and it was very interesting and exciting to see how the old one got out (that sucker put up a fight!) and to finally be able to see the damage. I got told that this plumber had never seen a faucet like this one and that everything – the pipes, the faucet, and the entire kitchen sink – was installed in a very strange way. Obviously, my kitchen is not built like a standard kitchen but that I could have told him before *laugh*. On the bookshelves happened a lot the past week! I bought some new books, got another one from a publisher and pre-ordered some for later in the year. And right before I posted this here I found some really great book deals that I ordered right away. But more about them next week. Not as much as I would have liked (the broken faucet put a lot on hold) but good enough to share it. And I started being active in the reading challenge for Legacy of Kings by Eleanor Herman over at the Lovelybooks forum. To get to the book info at Goodreads, just click the cover. Only Beautiful Lies isn´t listed at Goodreads yet (but I will change that as soon as possible), so no link behind that so far, sorry guys. Sounds like an adventure with the faucet! Glad it's all squared away now. And I've been waffling on Caraval- I've seen a lot of good reviews, a mixed one or two, and I'm trying to decide if I want to get it. It does sound fun... hope it's good! Hi Greg, I know Caraval seems to part people in either hate or love it. Well, in my case it was at a very low price for a hardcover and so I went for it. And it looks really good live in my hands *smile*. Thanks for stopping by. Oh my! I'm glad your patience got rewarded with you helping the plumber with your kitchen sink, Vi! And I always wonder why in some houses things aren't done the standard way... does that mean the people who built / installed things didn't have standard diplomas? Your new books look great! I've read The Sting and enjoyed it, I hope you will, too. Oh I am sure, the one who built my kitchen many years back was skilled and knew about the standards very well. The limited space of my kitchen is the actual problem and that they tried back then to fit everything into one side. They shouldn´t have done that or should have left out one drawer and everything would have been the normal way. But this plumber knew how to deal with it and did a great job besides teaching me a few things about water, faucets and the pipes. I love reading Sandra Brown books and am looking really forward to this one. Thanks for stopping by, Lexxie. Royally Screwed and Royally matched are great books! I liked Royally Screwed a bit more. That Sandra Brown book looks good. Enjoy your week! Alone the covers are awesome! Thank you for visiting my blog, Samantha. I am sooo happy that this adventure is now over *laugh* Thanks for stopping by. Wow, it sounds like you had quite the plumbing adventure. Glad all is fixed. Hope Chest looks interested. I a behind on my Chase books, enjoy them! I learned a lot, that´s for sure *laugh*. Thanks for stopping by and in case you are in for an emotional book you should definitely read Hope Chest when it comes out. Goodness, I'm glad you and the plumber were able to figure things out! I would be completely helpless. o_o Caraval! I loved that book. I read Legacy of Kings and its sequel - both are so intriguing, though I definitely liked the sequel more. I hope you enjoy your new books, Vi! Hi Alysssa, Legacy of Kings was a wonderful read though I am not sure what to think of the figures yet. Thanks for stopping by. Legacy of Kings looks so good! I'll have to check it out. I've yet to read an Emma Chase novel so I hope I fix that soon. Thank goodness the plumber and you figured it all out. Enjoy the books! LoK has been a nice read. I liked it though it was very bloody. Oh yes, the plumber story was quite something. I am so happy that it is finally over *laugh* Thanks for stopping by.